Topics: Services, Projects, and Clients. 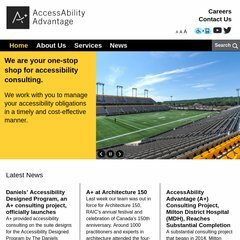 accessabilityadvantage.. About AODA, AccessAbility Advantage, Accessibility, AODA, Ontario ..
accessabilityadvantage.. Projects, AccessAbility Advantage, Accessibility, AODA, Ontario ..
Godaddy.com Inc (Arizona, Scottsdale) is the location of the Apache server. There are 2 Nameservers, ns33.domaincontrol.com, and ns34.domaincontrol.com. Accessabilityadvantage.ca's server IP number is 184.168.232.1. PING (184.168.232.1) 56(84) bytes of data.